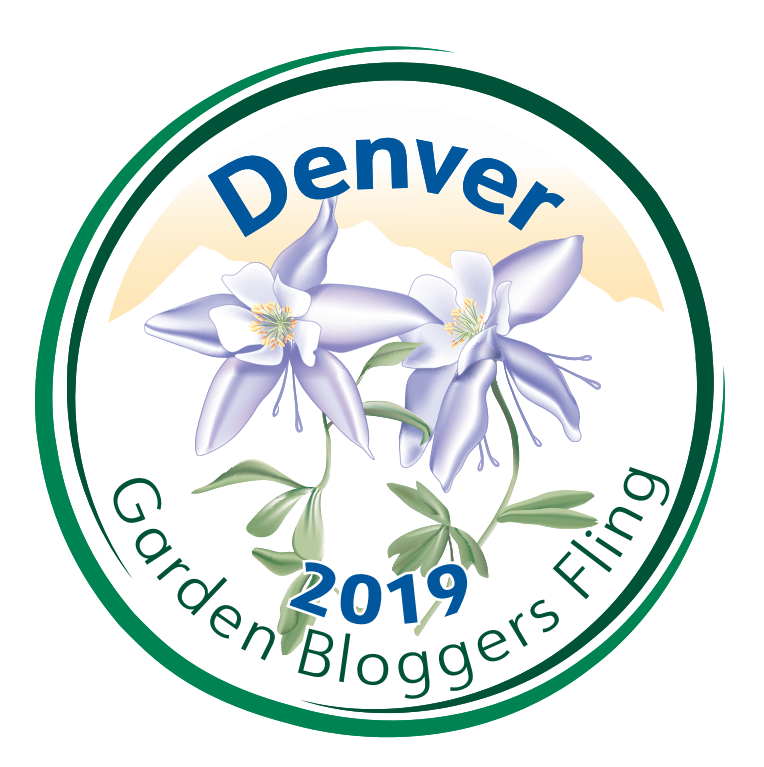 This post is for Garden Bloggers Bloom Day hosted by May Dreams Gardens. 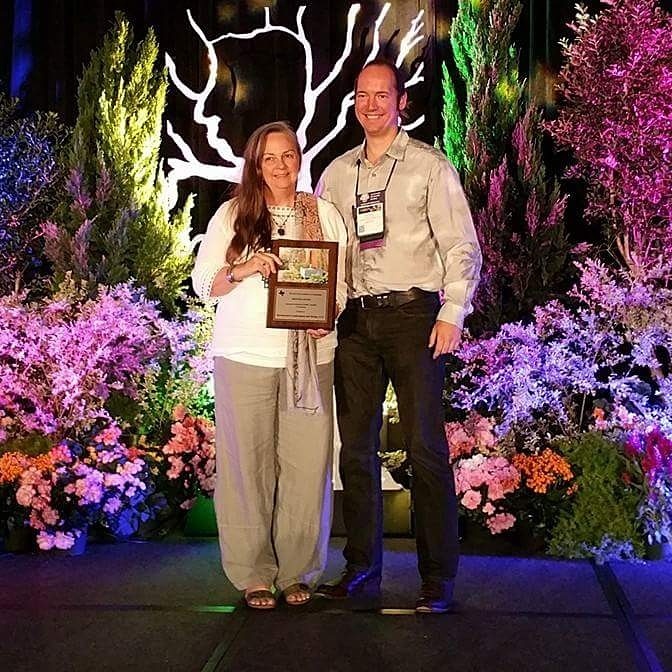 It happens the 15th of every month with garden bloggers from around the world sharing what is blooming in their personal garden. I love it because it reminds me to go out and observe and enjoy what is going on in my garden. Then it is fun to contrast it to other climates and time zones! In this photo you can see my lovely Tall Bearded Iris (Iris ‘Bernice’s Legacy‘) and our new sign that we hope will attract the attention of passers by and perhaps pique their interest. We have been having nearly weekly and sometimes even week long rain this year and it really shows in the garden. I checked the rainfall totals and we have had over 12 inches of rain so far this year. Below is a new bed we created in the ROW strip last summer. It is a test garden of sorts. It is only getting rain water. Because many drought tolerant plants also need good drainage we have created a mound using mulch and rose soil. 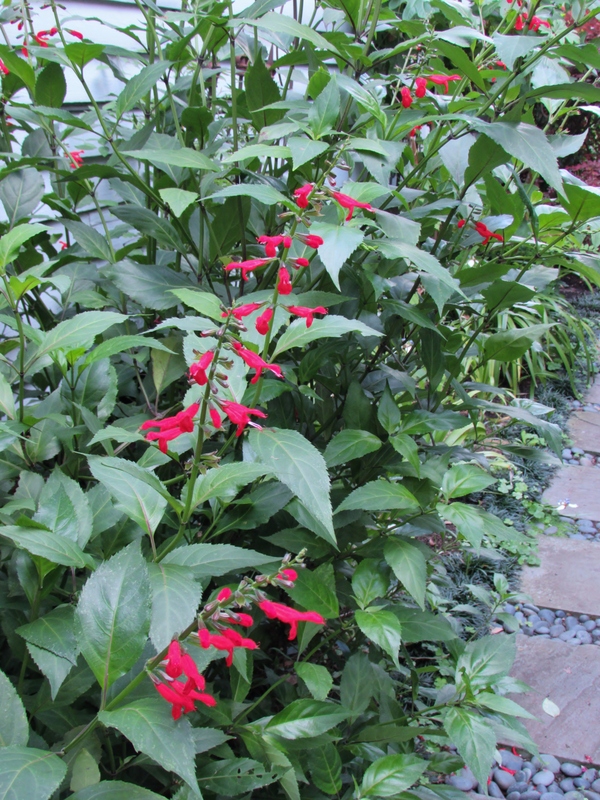 Salvia greggii in our new island mound in our ROW strip. 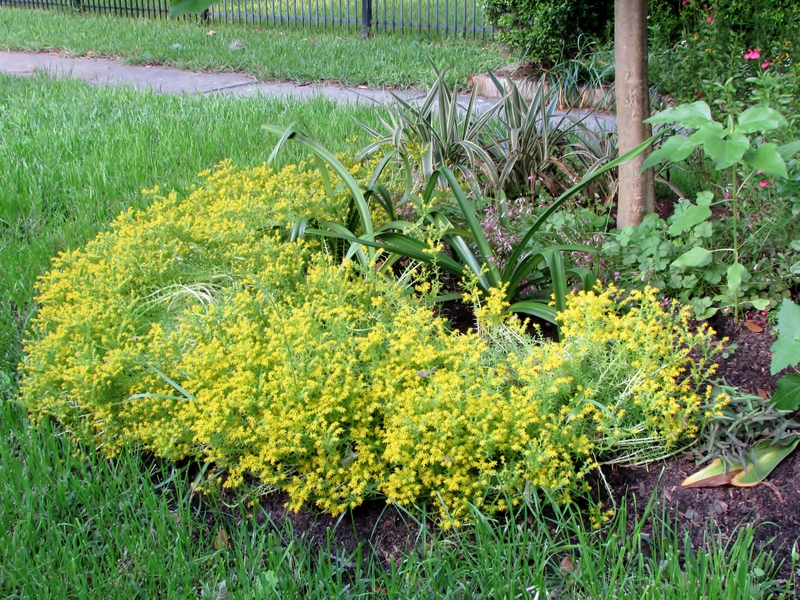 On the other side of this bed the Mexican sedum has a riot of blooms and I have seen lots of bees visiting it! I am enjoy the blooms of the Pink Wood Sorrel Oxalis articulata subsp. rubra. I know many consider it a weed but I actually planted the ones here. 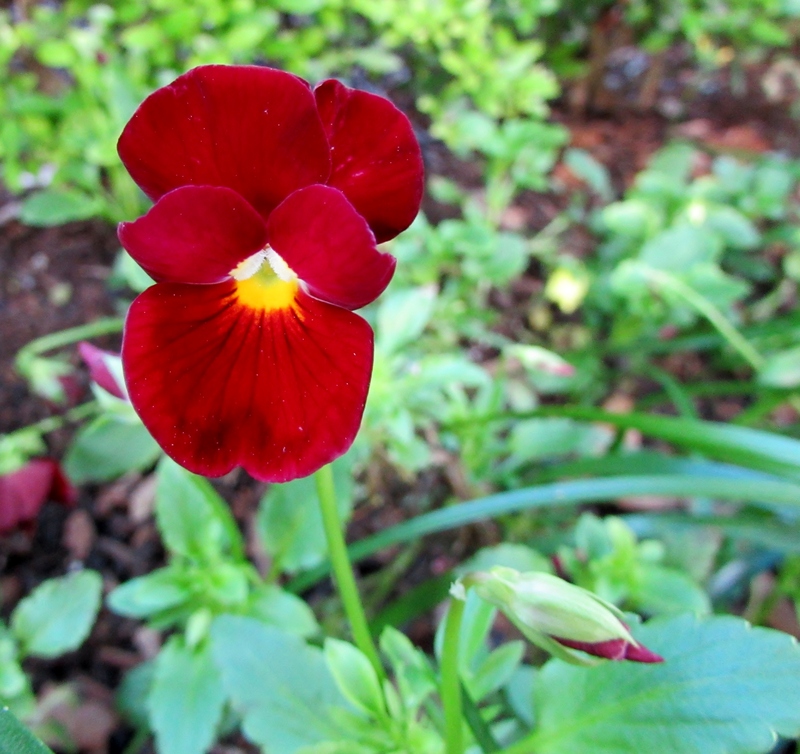 The Pansies in the annual bed are still putting on a show. If they go on much longer I won’t have time to plant our caladium bulbs. And who could bare to rip them out when they are so bright and colorful entertaining all the walkers. Back inside the fence the Giant walking irises we planted a couple of years ago are giving their best show ever! 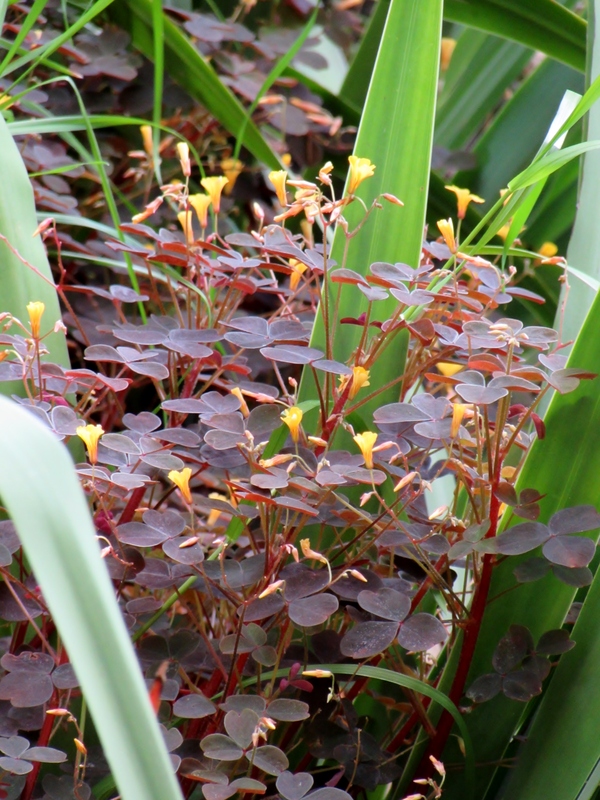 The little burgundy plants below are Volcanic Sorrel Oxalis spiralis subsp. vulcanicola ‘Zinfandel’ I stumbled on it at the nursery last fall and it has been hardy and multiplying ever since. 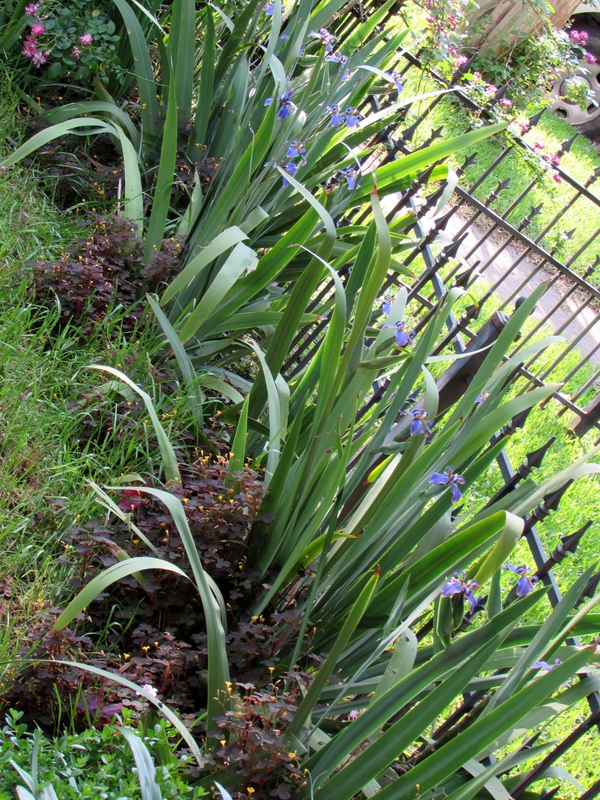 I am not sure I really like this color combination with the irises in bloom but I actually planted the irises to try and keep the neighbor dog from jumping the fence. I planted the oxalis there because I bought it and had no other place for it. 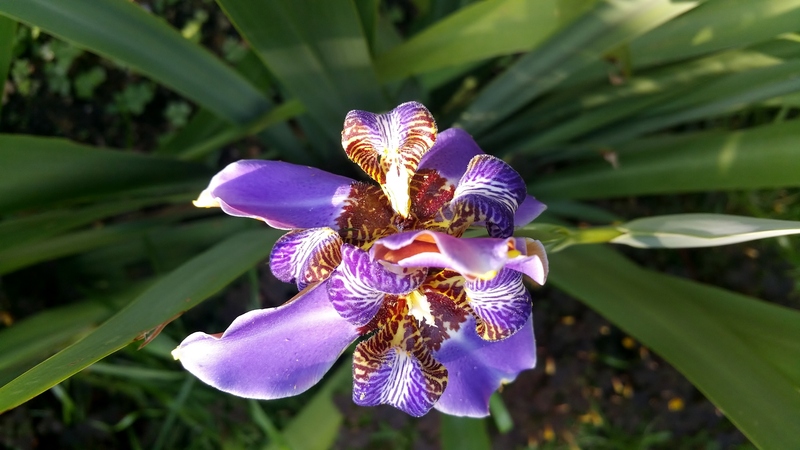 Plants trump design in my garden : ) The bluish purple of the irises is so vivid that I can see them while I am sitting on the porch.Shawn got this shot of a double flower on the Giant Walking iris catching the evening sun. 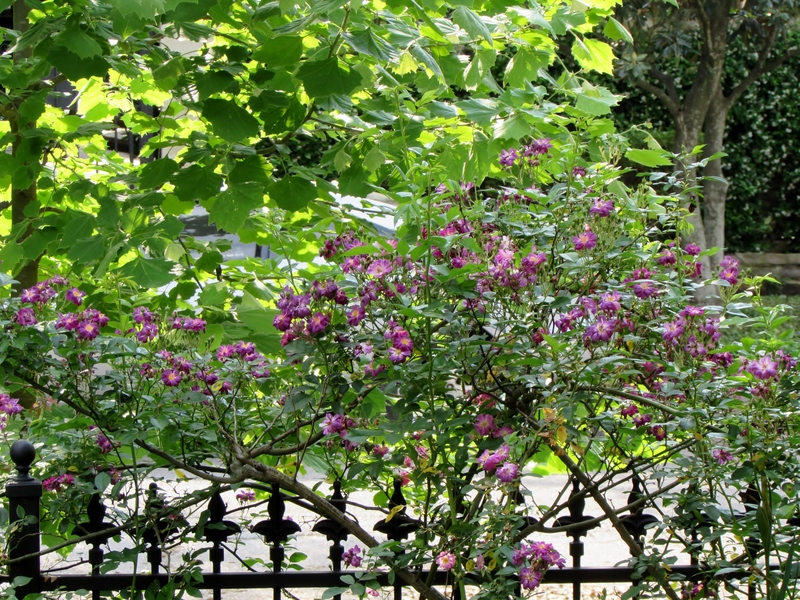 The roses on the front wrought iron fence have all been happy this spring. 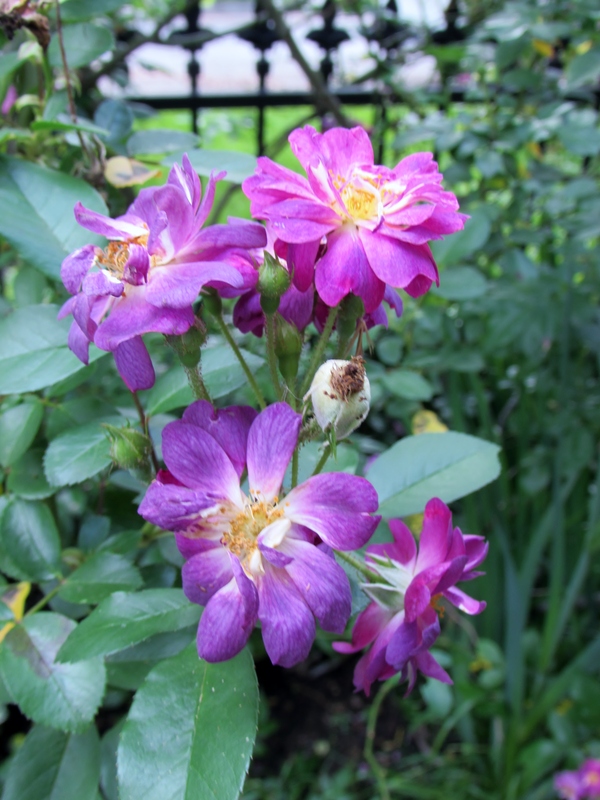 The Rosa Veilchenblau have been outdoing themselves. They are also known as the Blue Rose. Ours start bluish but then go towards purplish. They are a great rambler and take trimming well. I love the clusters of flowers like small bouquets. I planted these about 10 years ago and they have had their good years and bad years. Clearly they prefer rainwater to city water. 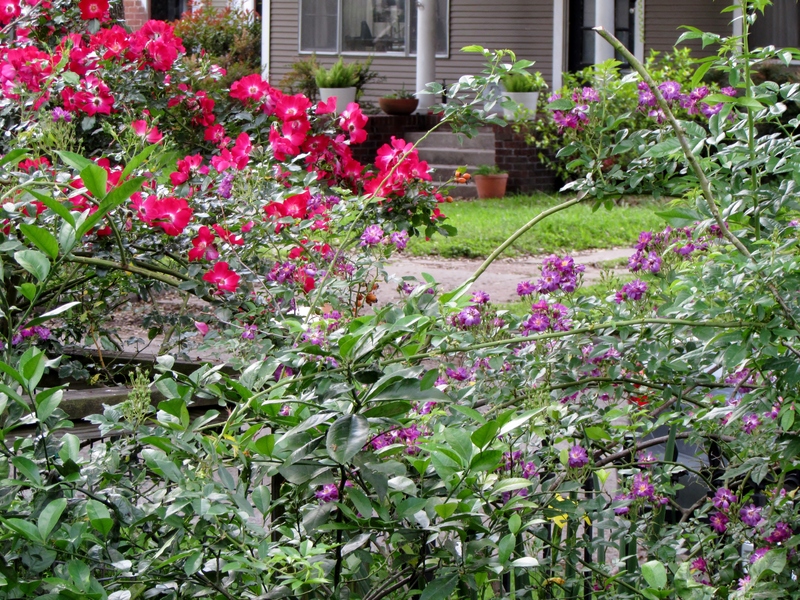 Here you can see them on the south side commingling with my neighbor Ann’s beautiful red roses. 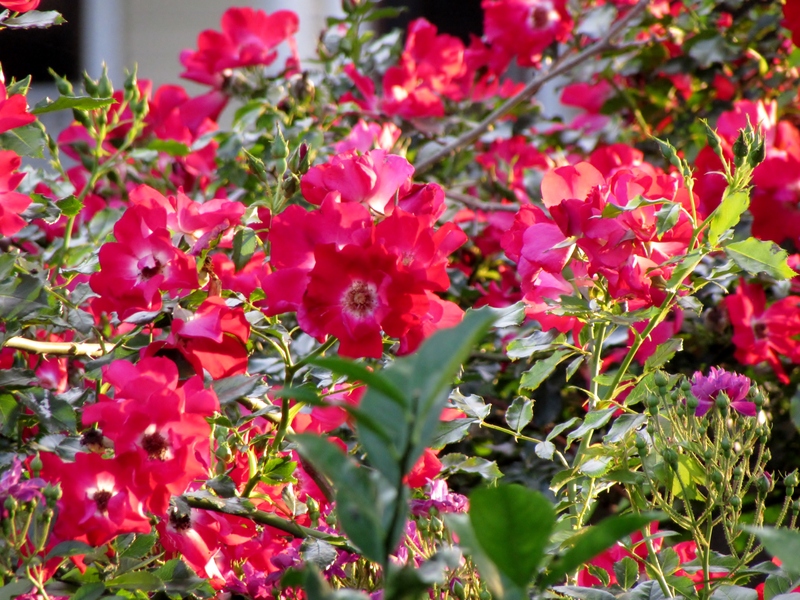 Later in the early evening I saw the beautiful red roses back-lit with sunlight. They were glowing! Red is so hard to photograph but I had to share! 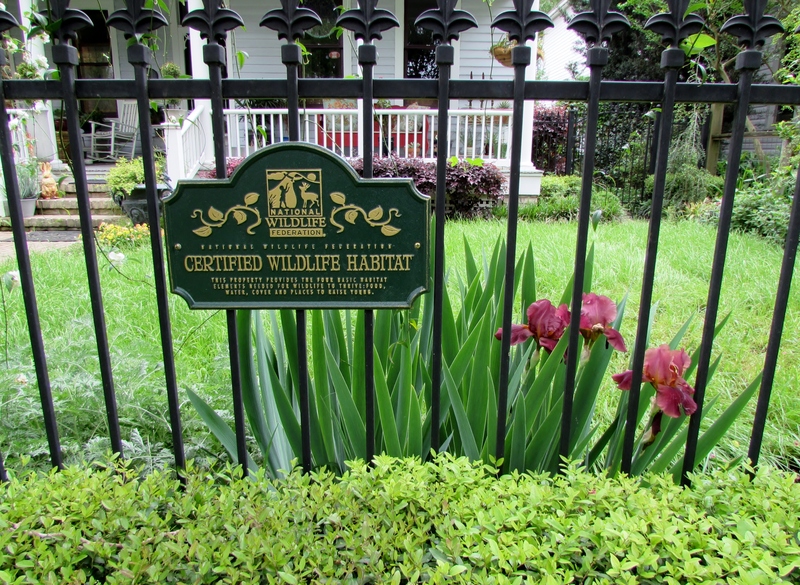 The roses along the wrought iron fence share their bed with an assortment of plants like the bearded irises. 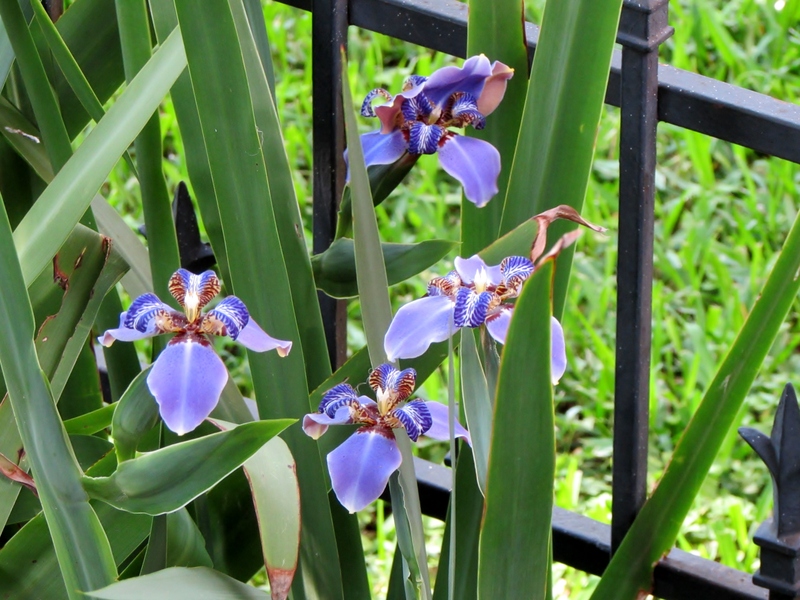 Right inside the gate on each side we have some Danny’s Dwarf butterfly irises. I love their compact nature and they will bloom of and on through summer. They stay under 18″ and are as low maintenance as you can get in a plant. I have only ever seen them at Treesearch Farms. You can see the birds have planted something else their too. I am sort of a wait-and-see-what-it-is weeder so it will stay for a while. Around the urns that flank the path near the front steps we have an ever changing variety of plants. The white flowers are Scopia® Gulliver Dynamic White Bacopa a charming little trailing plant. 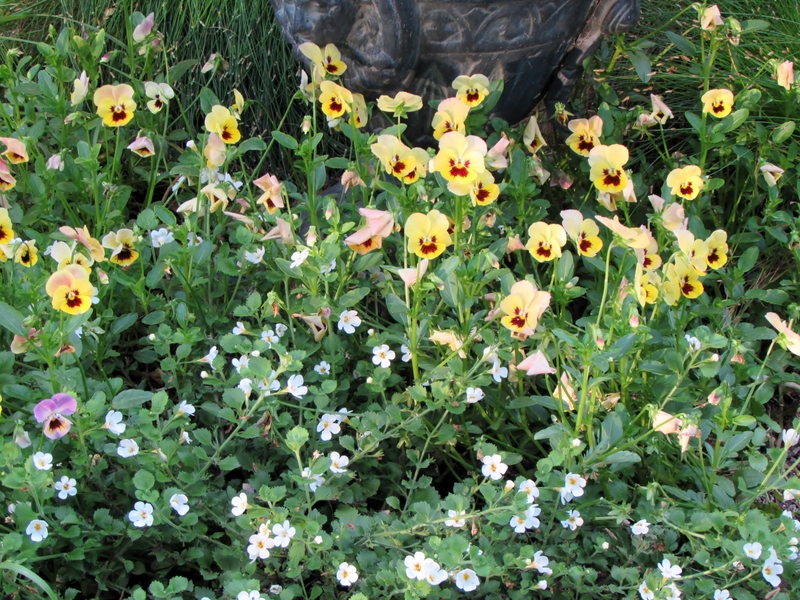 The yellow flowers are a smaller variety of pansies, i had the tag but misplaced it. 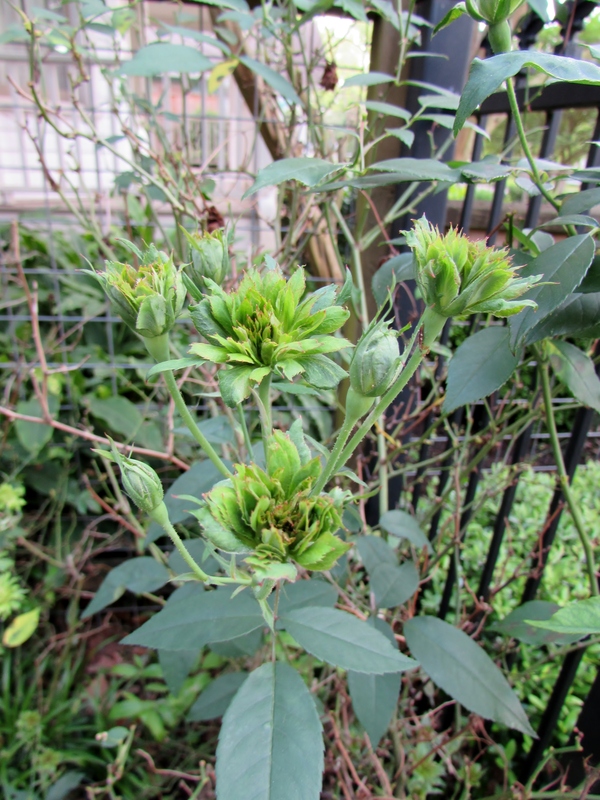 They have been blooming since November : ) Next we have one of my unusual roses. 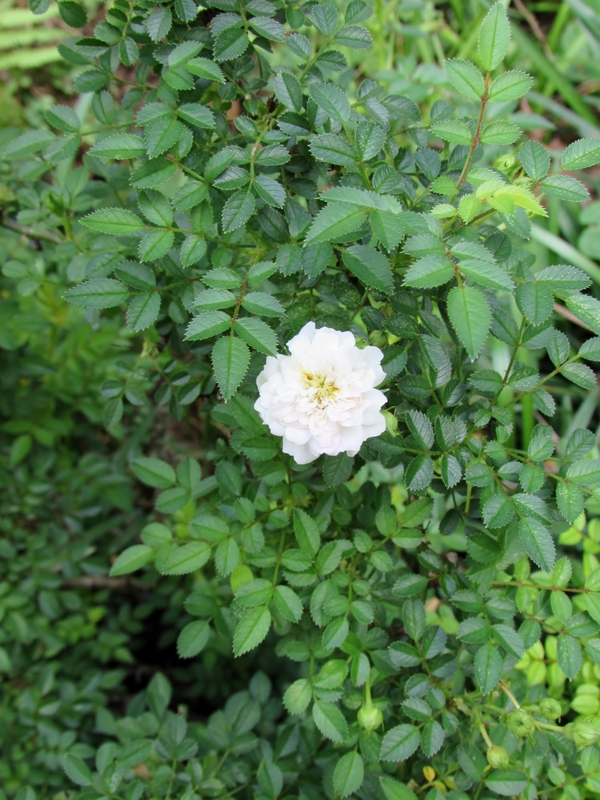 It is a Micro-mini rose that I bought from the Antique Rose Emporium years ago. I never did know it’s name. The flower below is smaller than a dime. 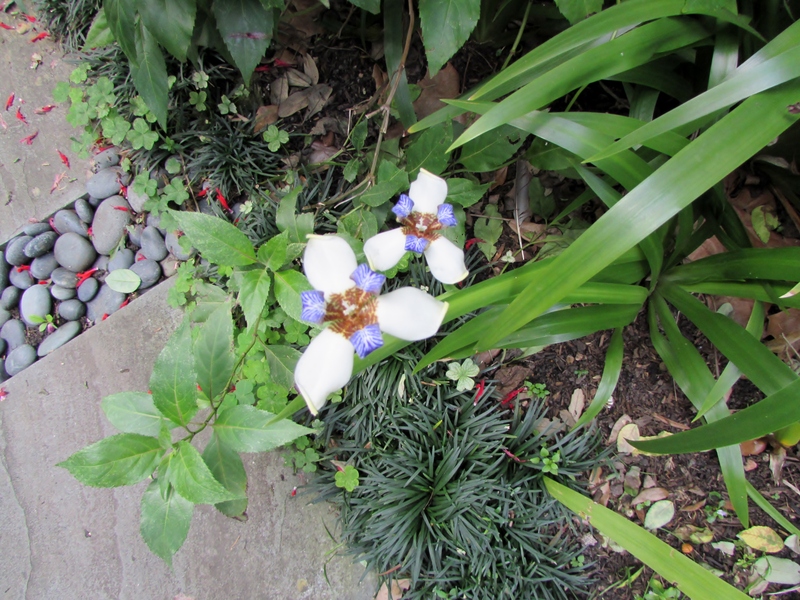 I think it might have bloomed more but it was being shaded by wood ferns that had invade the bed. Here is a bit more information on them! The other usual rose is our Green Rose that also came from ARE. My book says its history has been lost but that most agree it is a mutation, or sport, from a China rose. It dates back to before 1845 and some say as far back as 1743. I find it fascinating but have shown it to others with little reaction. They do still sell them at the Antique Rose Emporium. This brings us to the south side of the house which is shaded by the tall Japanese yews and the neighbors house. It does get nice morning light and filtered afternoon light. It is full of a menagerie of plants. A few of them are blooming right now. The Salvia miniata ‘Belize’ Sage or Misty Mountain sage has already been attracting many pollinators. It is so happy in this space but we do have to trim it back from the path now and again. I can see it out one of our office windows which is a treat. Along that same side we have filled in with several Walking iris that have been filling in the empty spaces. I find them a good ground cover if they get a break from the summer mid-day sun. 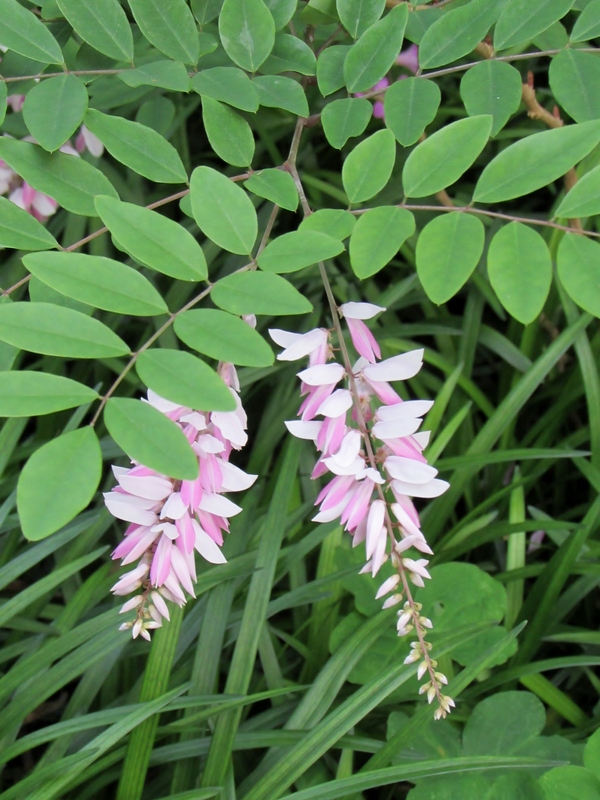 On both sides of the path we have a favorite plant of mine, Chinese Indigo, Indigofera kirilowii is semi-evergreen even in Houston. The flowers remind me of wisteria and its low growing nature makes it perfect for smaller beds. Further down we have a vine I bought on sale and have never know what it is. Five years later it has bloomed for the first time. 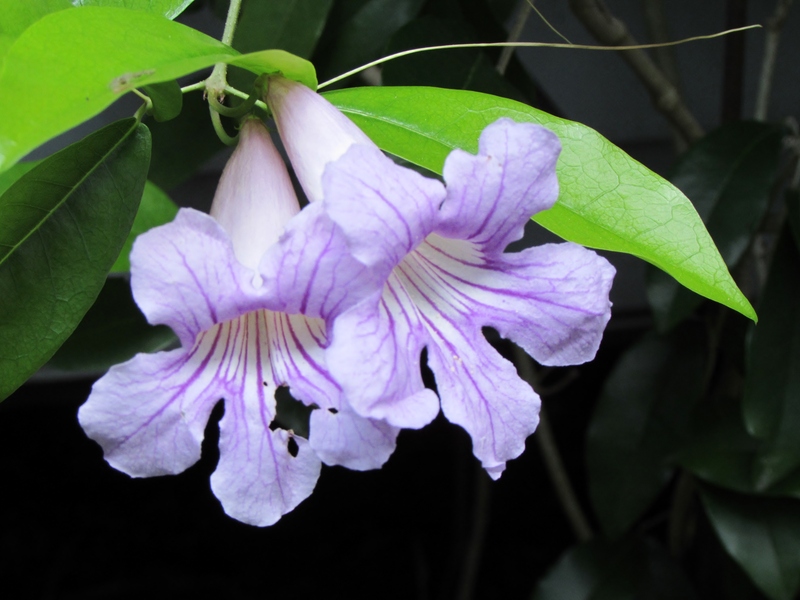 I did some research on the internet and I think it might be a Garlic vine, Mansoa alliacea, Pachyptera hymenaea, Pseudocalymma alliacea, Cydista aequinoctialis. If you now anything else it might be please let me know. I am just excited to see it bloom! 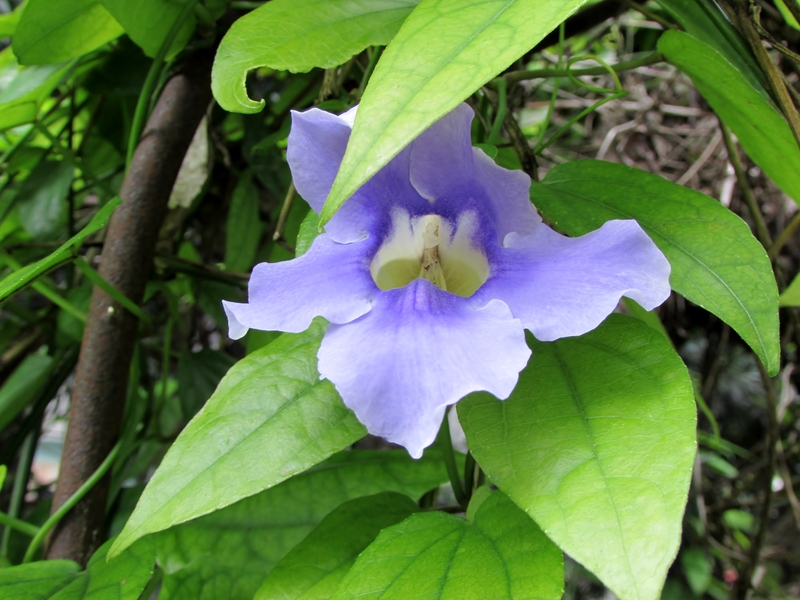 Update: a reader has suggested this is Violet Trumpet Vine, Clytostoma callistegioides and I do believe that is the correct identification having looked at the pictures and description. It said the leaves smell like garlic. We tried crushing them but didn’t notice a smell of garlic. It also said the flowers change color over time. And we do have flowers in different shades. 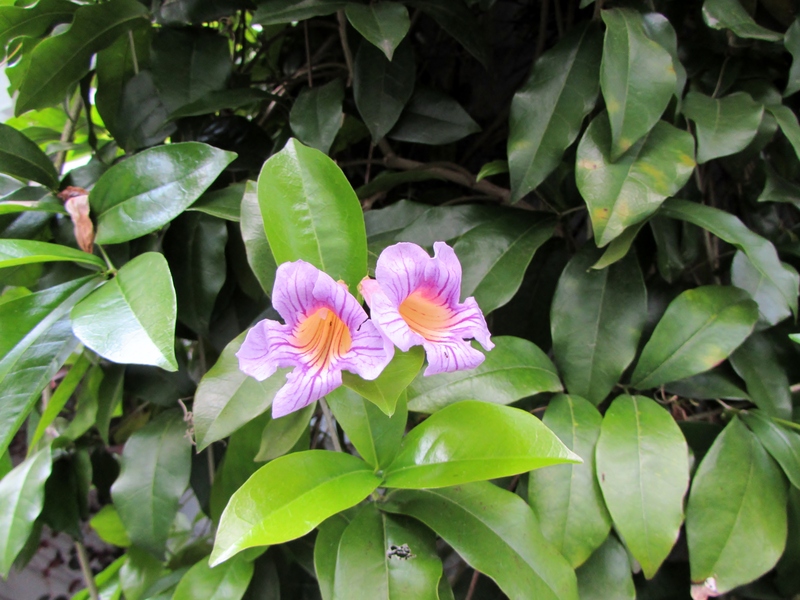 We have sent some photos to a friend that knows tropicals and I will amend this if he has a different answer : ) The Blue Sky Thumbergia is also starting to bloom. Last year it didn’t bloom because it died back to the ground after a hard frost. 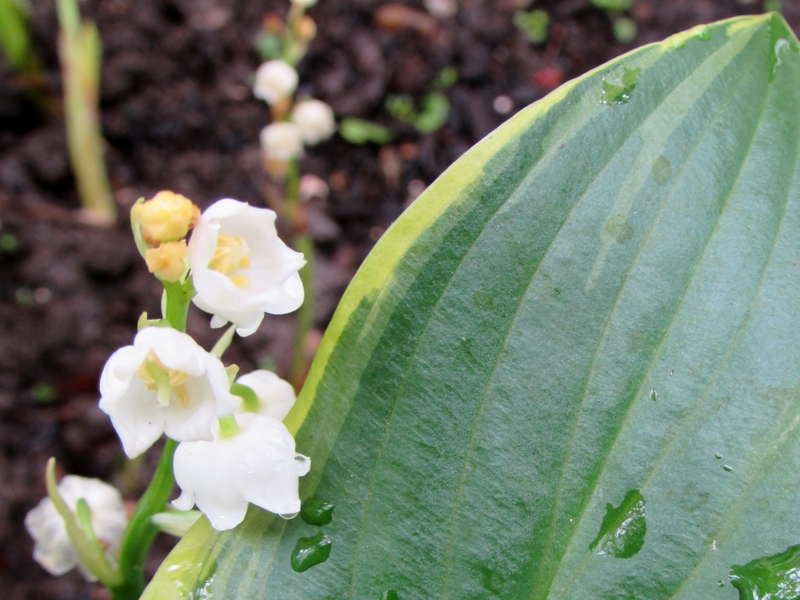 I think it was only 2 weeks ago we planted 24 Lily of the Valley plants. Shawn and I are May babies so this is our birthday flower. I have meant to try them for years and when I saw them on the Easy to Grow Bulbs website I decided to give them a try. They were just creamy white tips with roots attached when we planted them and now they are 4 inches high and flowering. All that saved up energy! These are peeking over a hosta leave. The holding area is full of flowering plants but with so much in bloom I am passing them by. 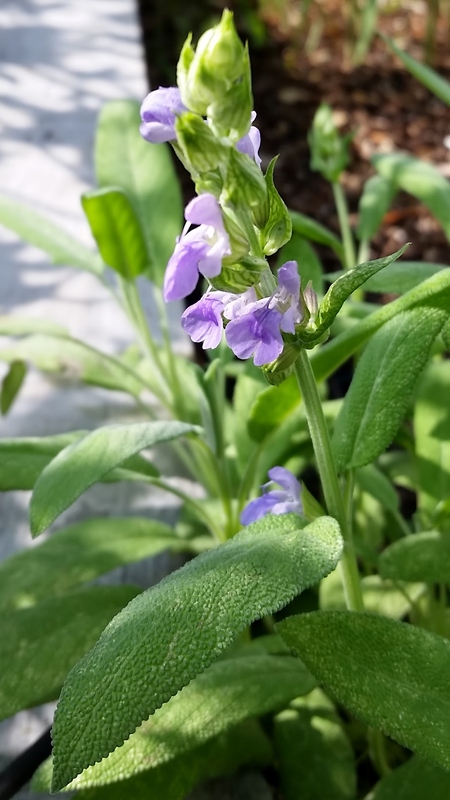 I did notice the cooking sage in the raised bed is in bloom. And their are lovely little flowers on a weed there too! 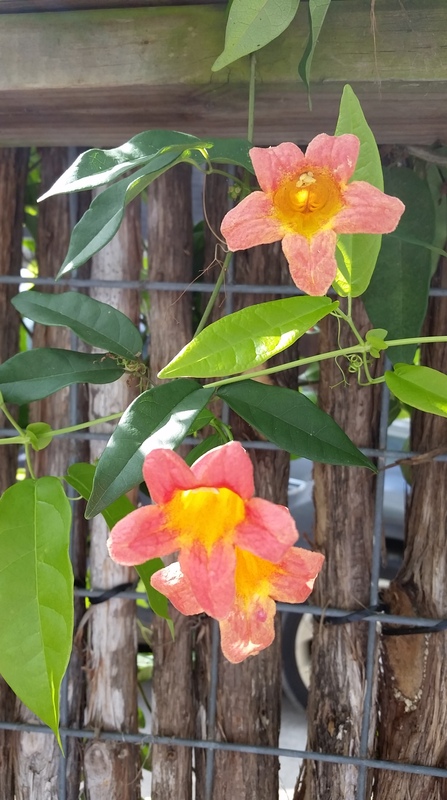 The Tangerine Crossvine that is planted on the other side of the fence is giving us a long show this spring. Seems even drought tolerant plants enjoy the rain. And last but not least my new Abutilon hybrid Lucky Lantern Yellow ‘NUABYELL’ PPAF. I saw one on another bloggers post and then found that our local nursery where featuring them. It seem fitting to put it in a cobalt blue pot. 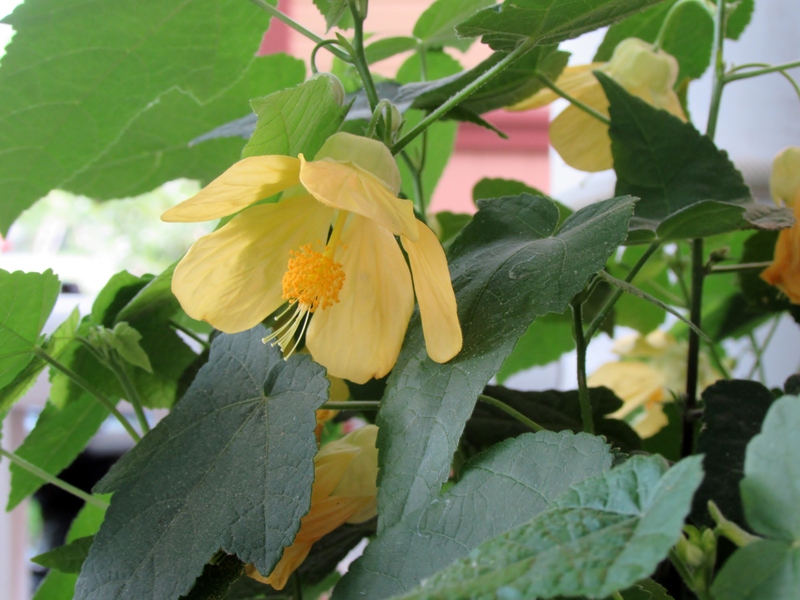 It is a dwarf abutilon and should be quite happy on the porch. I will stop here but have one last photo that you might not imagine is from a garden in Texas. The Heights and much of Houston is zone 9a. In the Heights we venture into being closer to zone 8b with our tree canopy and higher elevation. And with our very wet spring we are back to our lush green selves. 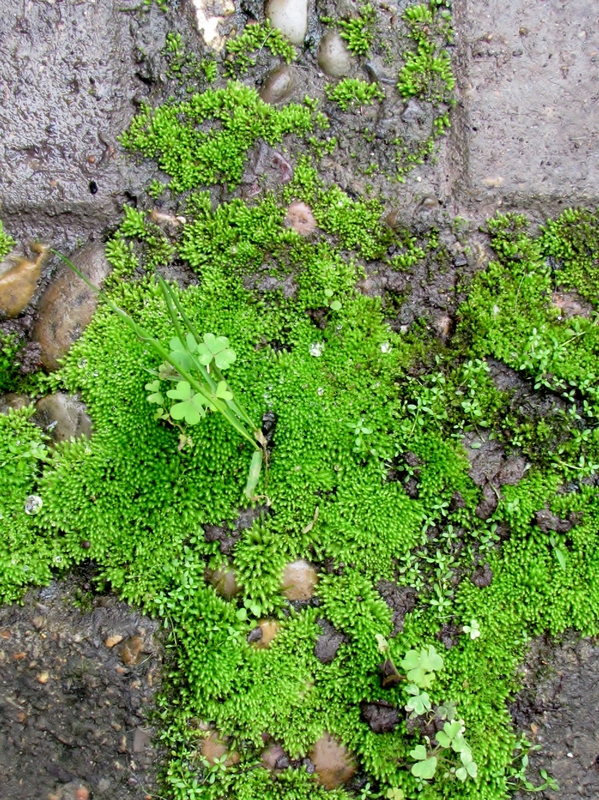 But you can’t imagine what joy it brings me to see this growing in the cracks! Happy Gardening! Lovely to see your roses in flower about six to eight weeks in advance of England. Yes Houston’s latitude is 29.7604° N, and London is 51.5072° N. For perspective Montreal Canada is 45.5017° N, we actually have a sub-tropical climate in Houston. If we have “normal” weather our winters are mild and don’t go below freezing. But sometimes there is an arctic blast that blows across the great plains and gets us with a hard freeze. It is a bit crazy too me but I am originally from San Diego California. Cheers! I’m not too far from you at the moment as I’m at the Texas Master Gardener conference, so I’m enjoying all your flowers in the flesh as well as online – or should that be in the petal? 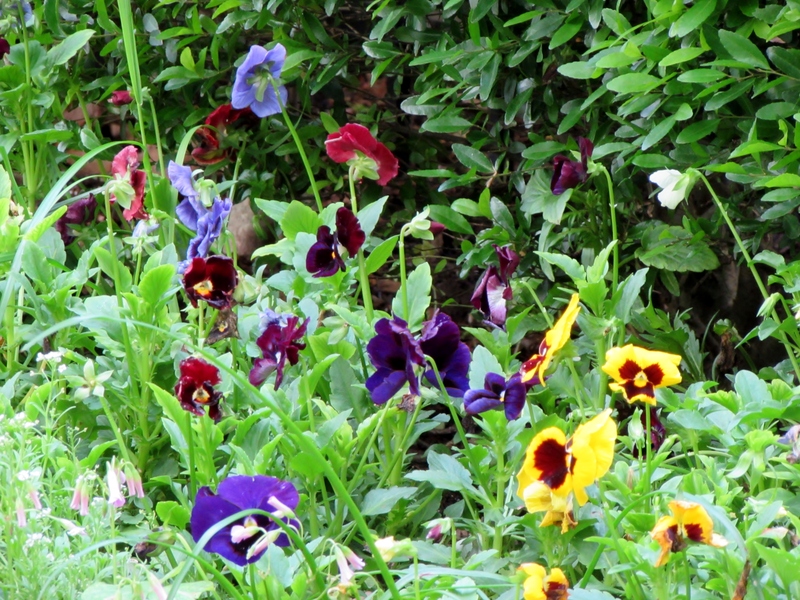 Your Houston flowers are looking very lush, it would be great to grow Abutilons and other more tender plants outside. 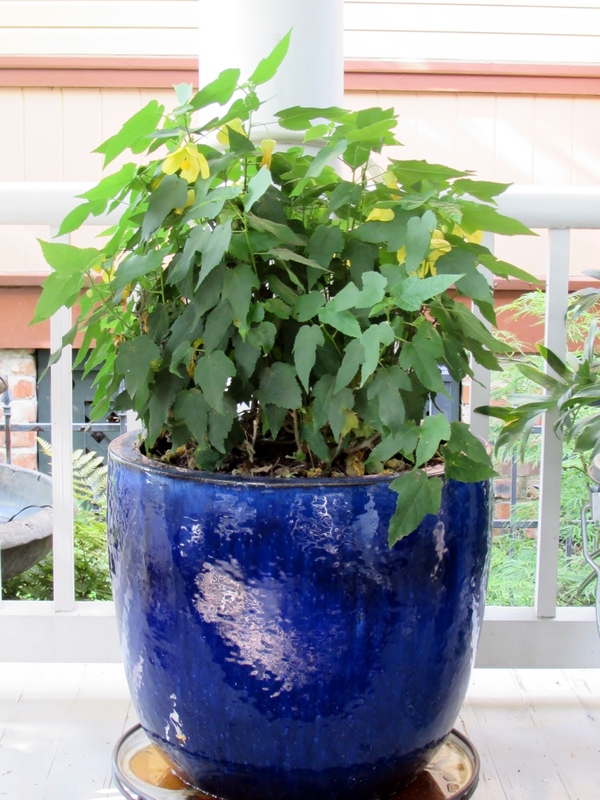 The yellow flowers look great with the blue pot. 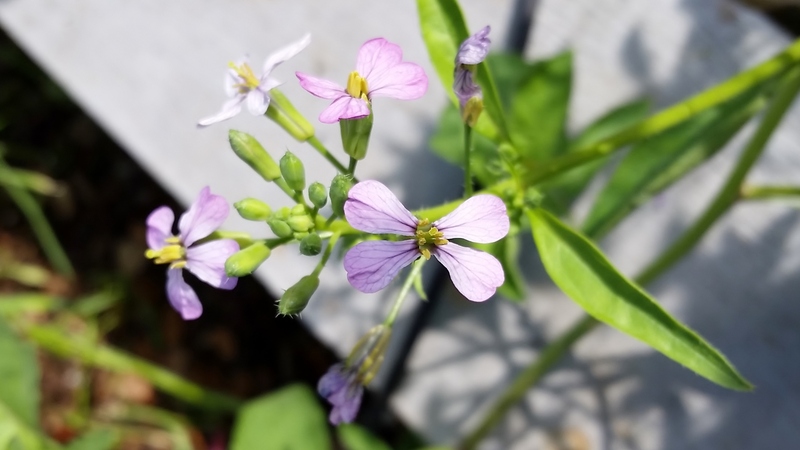 I like the pink tubular flowers, they seem familiar. 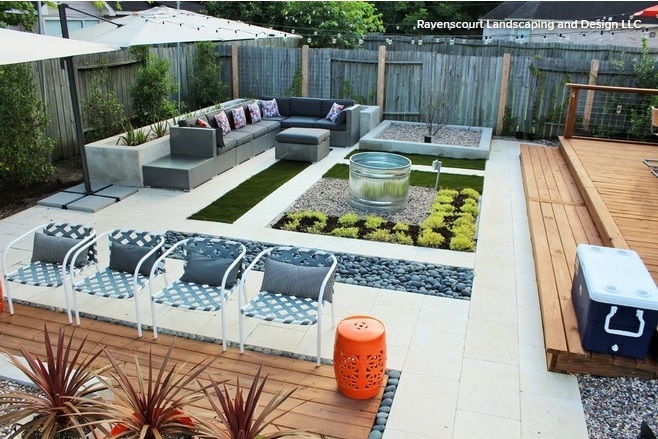 What a lovely garden, well done you! Both of you. BTW – why ‘walking’ iris? Thank you! 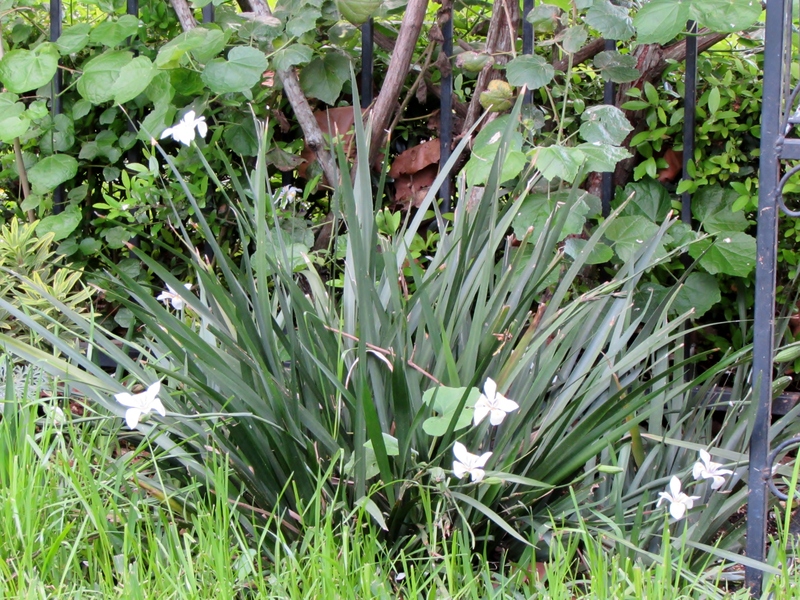 A Walking iris is the common name for (Neomarica gracilis). They are called walking irises because after they flower the head gets so heavy it often bends over and touches the ground and roots in. So they spread as if they are walking along. 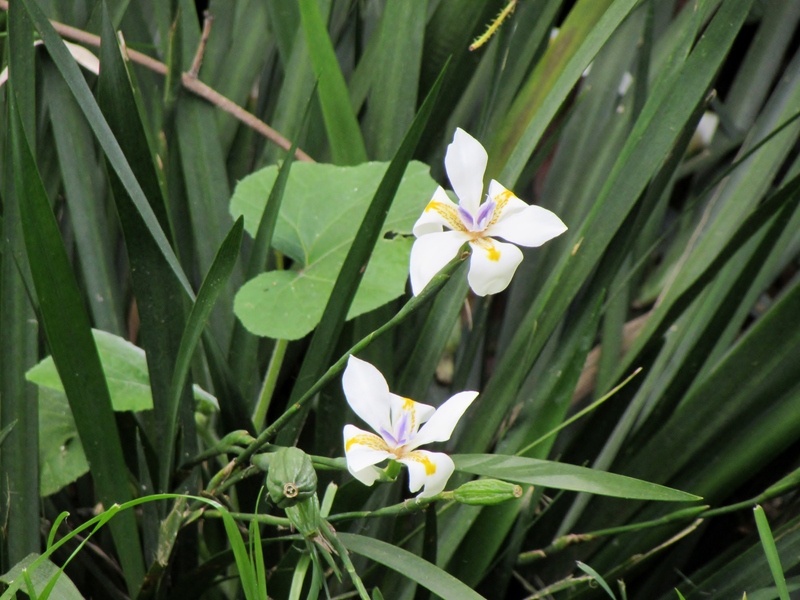 They come in a few other varieties like the giant ones that has blue flowers in the early picture and Yellow walking iris (Neomarica longifolia) and North’s false flag (Neomarica northiana) bloom in yellow. Super easy plants! Thank you. Thought there’d be an interesting etymology. Garden is looking beautiful. I love all of the Irises. My butterfly irises don’t put on much of a show, thinking it’s too much shade. Thank you Laura : ) If you have room they are hardy enough to move. Thank you Naomi! I think you are right. It looks just like Violet Trumpet Vine and that explains it not having a scent. 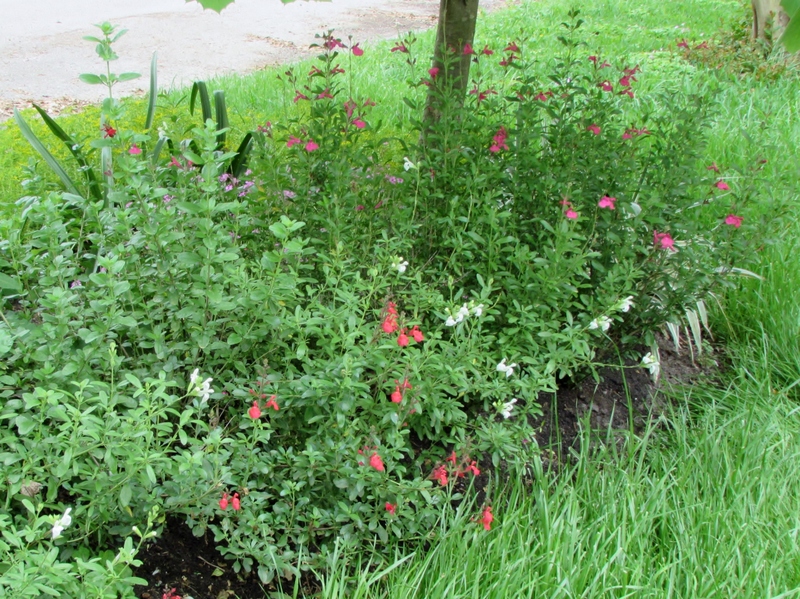 That Salvia looks like it is in glorious technicolor – almost unreal! I have tried and tried to get a photo of it but I just don’t have the right kind of camera or filters. And because we have had such a mild winter it has been blooming for almost a year now!